Motivated by her experiences with social injustice and discrimination, recent graduate Nehal Hindi came to NIU to study law and become an advocate for herself and others. As a recipient of the Embracing Diversity Scholarship from the College of Law, she was able to spend her final year of law school getting a head start doing just that. Nehal grew up in Chicago, the middle child of Palestinian-American parents. As a child, her father tutored her in Arabic on the weekends, and her family spent a year living in the West Bank when she was in grade school. Nehal was a curious and inquisitive child who understood the power and importance of education. Her passion for learning and her personal experiences with prejudice and discrimination helped to lay the ground work for her eventual career path. While studying psychology at the University of Illinois at Chicago, Nehal began advocating for herself and others. She also took an interest in learning more about the law and how it can be used to create change. The College of Law’s commitment to public interest law is what attracted her to NIU. “The first time I visited the College of Law, I remember the nervousness and excitement I felt as I walked through the halls of Swen Parson. I knew I wanted to be part of a law school that valued public interest work like NIU,” she says. As part of the requirements for receiving her scholarship this year, Nehal worked with another law student to create a series of events around diverse, and often overlooked or ignored, topics. Their last event of the year was particularly meaningful to her. Nehal and her classmate were able to schedule a speaker to give a presentation on the impact of politics and discrimination against Muslim women and the hijab. 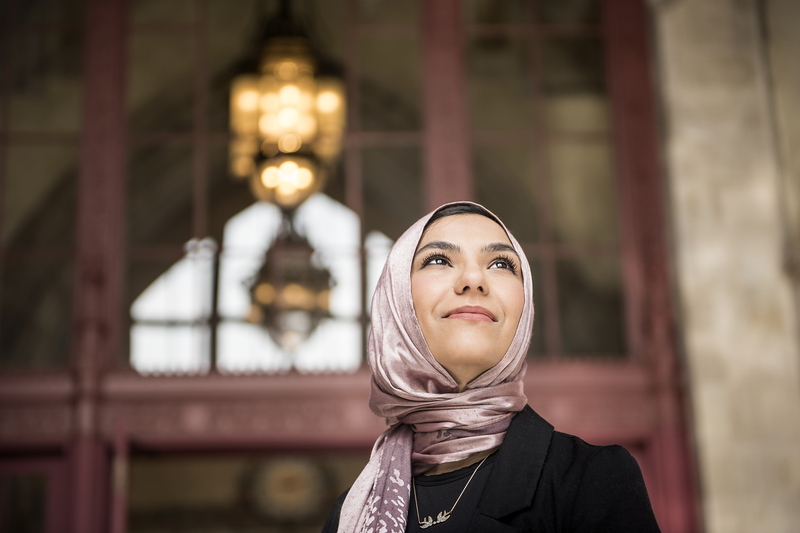 “As the only Arab-Muslim graduating in my law class, it meant a lot to me to share this project with my classmates and professors,” Nehal says. Student scholarship support is an important area of need at NIU. If you would like to help current and future Huskies like Nehal, please visit go.niu.edu/give2niu today to make your gift in support of the Student Scholarship Fund.